No search has been performed. Allows you to quickly access functions and tools (Customizing the Toolbar). Allows you to change how the BaseCamp™ application presents information using activity profiles (Activity Profiles). Allows you to search and filter your saved data and map information using the search toolbar (Search Toolbar). Shows the current orientation of the map (Rotating the Map). Adjusts the map view. The map controls appear when you move your mouse cursor over the north indicator (Map Controls). Provides a geographical context for the map by displaying a broader, less-detailed view (Changing the Map View). Displays lists in My Collection, saved geocache searches, and connected devices (Data Management). Displays your map product, waypoints, routes, tracks, points of interest, and other map details (Map). Displays details about the selected item (Viewing Item Properties). Displays details about the selected item. 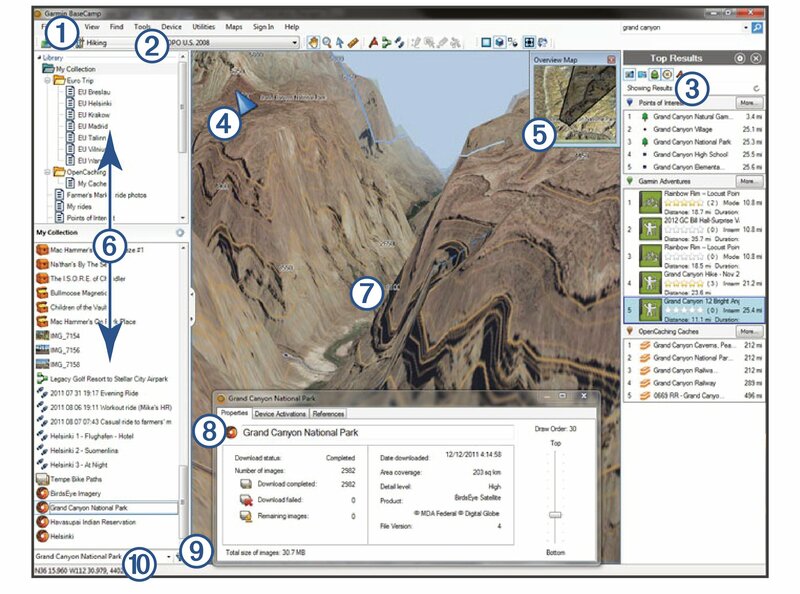 Displays map coordinates, and shows measurement information when measuring distance. Searches and filters saved data.